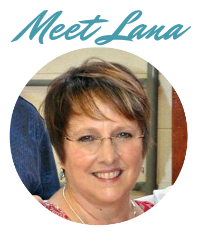 WIth a month loaded up with volleyball and soccer games, it's been hard to find time in the kitchen, but I have several Gluten-Free (GF) flours and products I want Bear to try, so it's time to make time! Pizza is a HUGE food choice for most kids, and it's been the hardest for Bear to give up. Thankfully, there are some brands of frozen pizza that she likes; Udi's is top on her list, but we like to make pizza at home, so the search was on to find a tasty pizza crust. 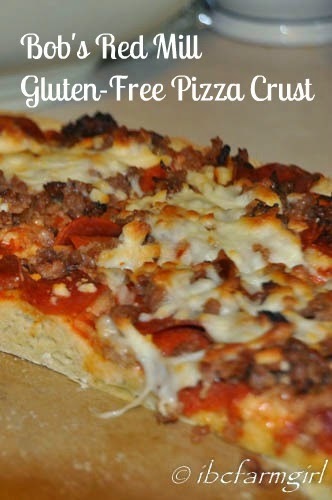 This crust is super simple to make. You start with Bob's Red Mill Pizza Crust mix. It comes in a sealed bag, and included in there is a packet of yeast! (I am bad about having yeast on hand when I want it). It calls for 2 eggs, 1 1/2 C. Water, 2 Tablespoons of olive oil, and that's it! You mix it all up until a ball forms, then let it raise for 20 minutes. The most different aspect of this GF recipe is that you are to spread it on the pan/stone with wet hands. I admit I was a bit skeptical on that direction, but it really worked. The dough is not an elastic kind like wheat flour crusts are. It's more like a ball of biscuit mix, and it spread easily without any sticky moments. The difference I am finding with these crusts is that most ask you to bake for 5-7 minutes BEFORE adding toppings. Tall Guy thought that might be a good idea for any crust that is kind of thick. 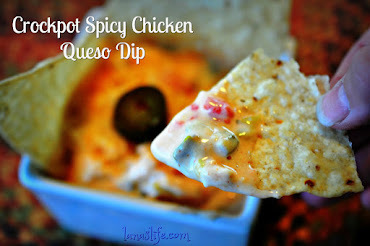 Tall Guy helped me out with this recipe, so he is spreading sauce and toppings for me. 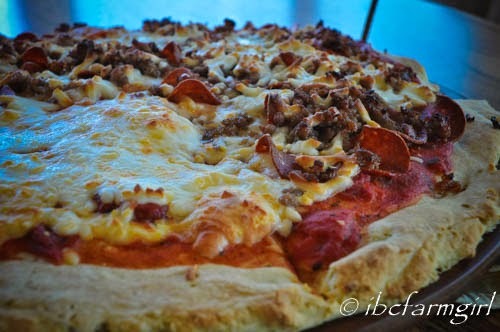 I have to tell you that the sausage on our pizza came from a 4-H hog we went in on. (That means we bought half of it). It's the first time we have had packages of pork in our freezer, and I think I am going to like that! After the pizzas was dressed up in all its toppings, it went back in the oven for 15 or so minutes. 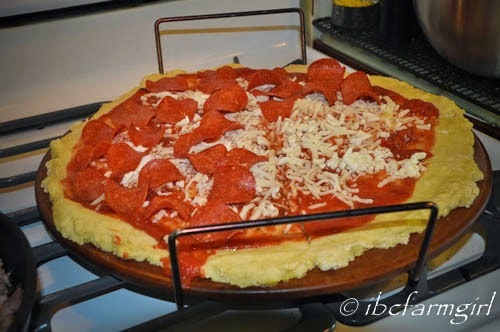 The quarter part of pizza with just cheese is Bear's. It looked good, it smelled good, so I was very hopeful it would pass Bear's sometimes picky taste buds....... and it din't disappoint! She LIKED it! What's even better is that we all liked it! As we try to create GF meals for Bear, we have decided to eat the same food she does for most of the meals. TG and I still have the occasional wheat bread sandwich for lunch, but Bear isn't here for that meal. 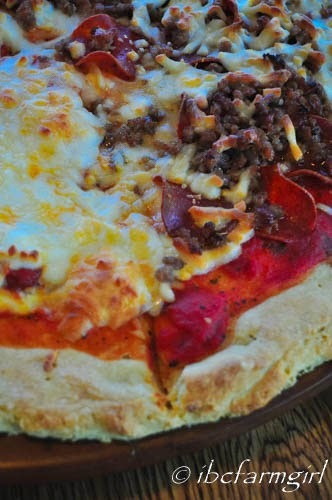 So we are giving Bob's Red Mill GF pizza crust a 5/5 star rating in our home!! I can't wait to try more of their mixes. 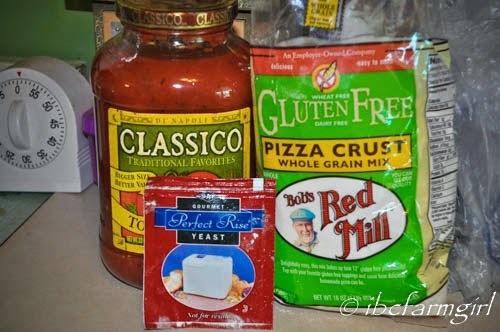 3-1/4 cups >Bob's Red Mill Gluten Free Pizza Crust Mix, 16-Ounce Bags (Pack of 4) Use one bag. 2. In a large bowl, combine water and yeast. 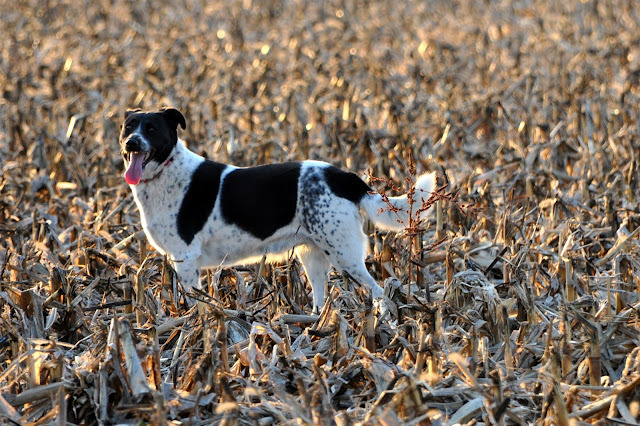 Let stand a few minutes. 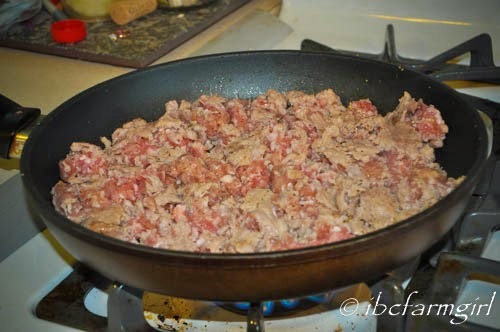 Add eggs and oil to mixture and blend briefly. Add GF Pizza Crust Mix and blend about a minute on medium speed, until combined. 3. Leave dough in bowl, split in half, cover with plastic wrap and allow to rise 20 minutes. 4. 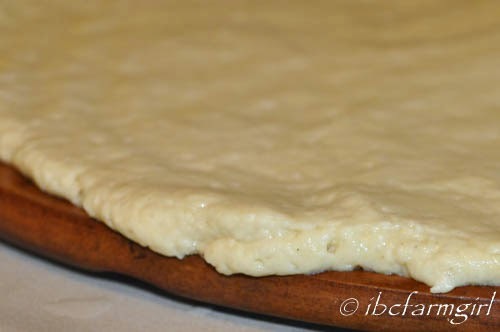 Place dough on greased pizza pans. 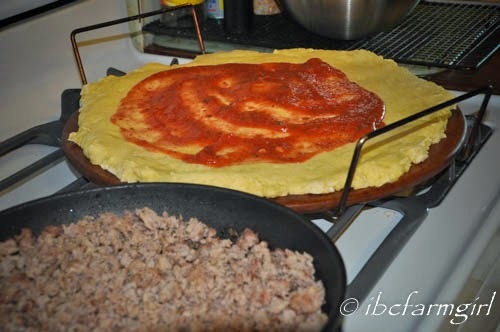 Using wet hands, spread out dough to cover the full pizza pan. Bake without topping for 7-9 minutes. 5. Remove from oven, cover with favorite sauce and toppings. Bake for 15-18 minutes. Makes two 12-inch or one- 16-inch pizza crusts. I bought this mix on my own. Bob's Red Mill did not ask me to blog about it, but I do plan to work with them in the future to try more of their mixes.